Mobile Opera, located on the Gulf Coast of Alabama, is one of the oldest performing arts organizations in the United States, as well as the oldest in the State of Alabama, having been founded as the “Mobile Opera Guild” in 1945. Under its founder, Madame Rose Palmai-Tenser, a European concert artist from Czechoslovakia, two performances were presented in April 1946. As its General Director, Mrs. Tenser continued to lead the company until her death in 1971. Katherine Willson became the company’s Production Coordinator and General Manager and oversaw the growth of the company through the next twenty-five years. During the company’s 1995/1996 season, she became the first female President of the Board, celebrating Mobile Opera’s 50th Anniversary Season and her own thirty-five year involvement with the company. Under Pelham “Pat” Pearce, Mobile Opera maintained its productions’ quality and its innovative programs dedicated to education and community outreach. 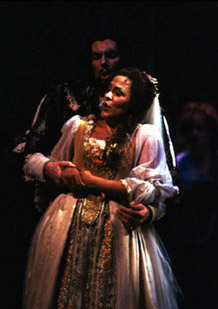 The development of Mobile Opera as a nationally recognized company continued with the ten-year supervision of Jerome Shannon as General Director. Shannon was succeeded by Earl Jackson who retired in 2011. The company currently operates under the direction of General Director Scott Wright. In July 2002, Mobile Opera relocated its offices to the Josephine Larkins Music Center, a newly renovated rehearsal and administrative facility located in the designated downtown arts district, which the company shares with the Mobile Symphony. This collaboration between two of the city’s most important performing arts organizations has been instrumental in the revitalization of the downtown area. With a 2,400-square-foot rehearsal hall, seven private music studios, conference room, catering kitchen, patron ticketing services, landscaped courtyard and administrative offices, the Larkins Music Center is a significant cultural and community asset. Mobile Opera continues to encourage young American operatic talent. Artists such Christine Weidinger, Michael Devlin, Susan Quittmeyer, Anthony Laciura, Gran Wilson, Barry McCauley, Stella Zambalis, Linda Zoghby, Amy Johnson, Philip Webb, Andy Anderson, Hal France, and Sylvia McNair are veterans of the Mobile Opera stage who have made appearances with major opera companies and festivals across North America and Europe. Under General Director, Scott Wright, Mobile Opera continues its commitment to quality productions and education. In addition to main-stage productions, programs of opera excerpts are presented in schools and community venues throughout the region, establishing the company’s long-standing commitment to arts education in the schools and communities of Alabama and the Gulf Coast. Education and Community Outreach, under the direction of Stacey Driskell, produced “Pigaro’s Diner” beginning in 2009. This award-winning program on child nutrition has been seen by more than 50,000 Alabama school children.